A mother out with her daughter with the Joovy 360 Ultralight Stroller. It can be taken wherever you need it to go! The Joovy Zoom 360 Ultralight Stroller is a budget stroller as far as jogging strollers go. It is affordable compared to the higher end budget strollers which can go as high as $500. The title ultralight is a little bit deceiving since it does weigh around 25lbs, which is the average weight for a jogging stroller. It is also easy to assemble and easy to use, Joovy makes sure that the stroller is user friendly. It is also easy to fold but does require both hands, but this is worth the compromise since it does come at a budget and is extremely compact for a jogging stroller when folded. The Joovy Zoom 360 Ultralight Stroller is made out of a graphite and aluminum frame which allows the Joovy to be lighter and flexible. 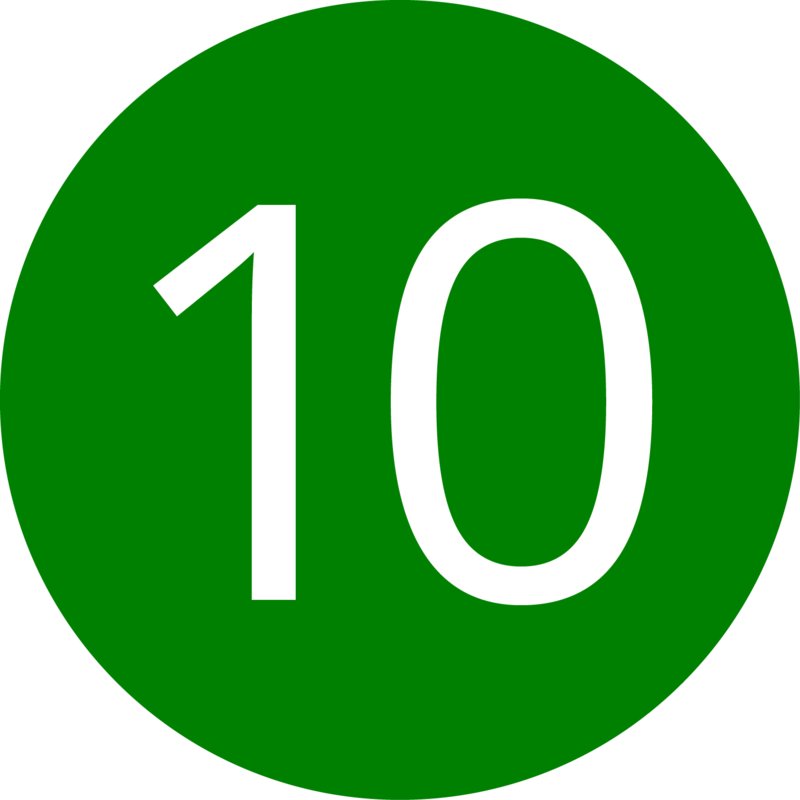 The other parts of the Joovy such as sun shade and seat are seat to be thin by users which is why the Joovy was not able to score a 10 on this scale! 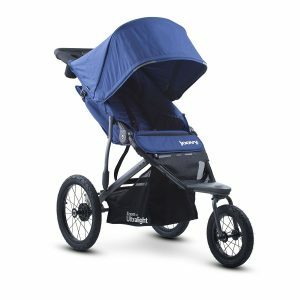 The Joovy Zoom 360 Ultralight Stroller is a good weight when it comes to Jogging Strollers, many usually break 30lbs but no the Joovy it weighs a decent 27lbs. This will enable users to easily store and carry the Joovy Zoom 360 Ultralight and put it into their trucks or storage units. The Joovy Zoom 360 Ultralight Stroller has a break bar on which is attached to both rear end wheels. Users have stated that this break bar is stiff and requires a little bit of a push to get it locked, and it is not flip-flop friendly. 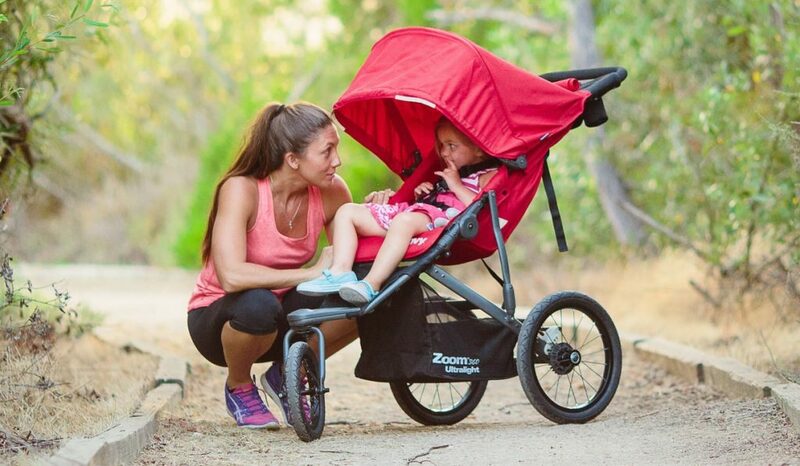 The Joovy does not have a hand-break which is something that other Jogging Strollers have, it is usually used to go down hills or inclines without having to put stress on the users arms. The Joovy also is compact when it is folded which allows it to be stored easily in the trunk of a sedan or SUV. The stroller is also not as large as other Jogging strollers when folded it only measures in at 19″ H x 25″ W x 34″ D. Other Jogging Strollers such as the BOB Revolution SE Single Stroller when folded is 39″L x 25.5″W x 16″H so much longer, which is harder to store. The Joovy Zoom 360 Ultralight Stroller is very easy to use, all of the features on this stroller accessible and intuitive. The only reason it cannot score perfectly is because it does not possess a hand brake on the top which makes it difficult to go down inclines or hills. But its recline and two hand folding feature are easy to operate and understand. It is also equipped with a back pocket and cup holder which allows the parents to stay organized while on their run! The user of the Joovy Zoom 360 Ultralight Stroller will be very happy with how it folds since it only takes three steps. But it should noted that it does take two hands to fold, but this is not uncommon for a Jogging Stroller since many of them are of large size that a standard stroller. This stroller does have an adjustable handlebar, however the handle bar is coated in foam which allows for less strain on the users hands and arms. The Joovy has decent maneuverability which can be attributed to its front wheel that can rotate 360 degrees with a height of 12″. Its back wheels are higher at a height of 16″ which allow for more stability. The wheels are rubber which help to maneuver on off road areas with ease. 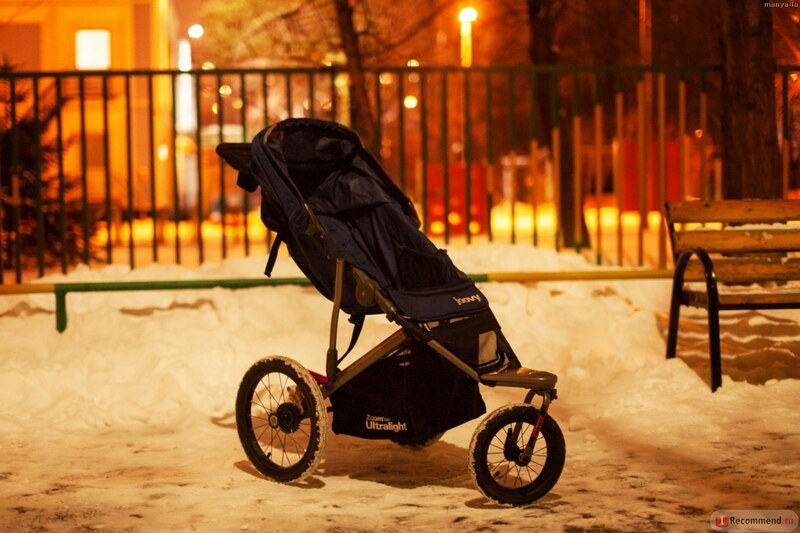 The Joovy Zoom 360 Ultralight Stroller is capable of handling rough terrain. It has rubber wheels which help absorb the shock from bumps and suspension in its rear tires to help smoothen up the ride for the baby and user. Accessories included with the purchase of the Joovy Zoom 360 Ultralight Stroller include two cup holders and a accessory pouch inbetween the two. These allow for the user to stay organized while using the stroller. Additional accessories that can be bought include car seat adapters, mosquito nets, car seats, and rain covers. Assembling the Joovy is very easy, when delivered or bought the stroller comes close to fully assembled. All the user needs to do is attach the wheels and the stroller is good to go (read review here). The Joovy Zoom is not as easy to clean as other strollers since its fabric is non-detachable. It has to be cleaned on the spot. However the wheel are detachable so it is possible to clean them with a hose or other means. This stroller has adequate storage capacity to suit all of a parent’s needs. It also has a mesh pocket on the back of the stroller just for parents to store smaller items. On top of that The Joovy also has a accessory kit that is placed in between two cup holders. It also has very generous storage space in the compartment below. The Joovy Zoom 360 Ultralight Stroller is padded well enough for a child to fall asleep in during their daily pushes. But it should be noted that the seat has a light padding which is not as comfortable as other strollers. The leg rest is not adjustable so taller children might not be as comfortable in this. The sun shade enhances the experience for the child as well since it is very generous. The Sun Canopy is very generous and covers the child with ease. It has the ability to be retracted or kept up. This stroller has rear wheel suspension which does limit the shock absorption, but it is possible to take this out for a spin on the rough terrain. It is still very versatile and can be used on all types of terrain. The user just has to make sure to keep the wheels clean to prevent loss of durability.